Watching the 2008 NBA Finals between the Boston Celtics and the Los Angelas Lakers, it never occurred to me that Boston had 12 black players and a black coach. Boston is consistently talked about when it comes to race relations especially in the area of sports. In numerous conversations personally and heard, the city has been accused of being anti-black in life and sports. I lived in Boston in the late 80’s and the experience was uninspiring except for the fact that I met three of my dearest friends there along with their network over time. I have rarely heard anyone speak favorably of Boston other than those who grew up there and a handful of foreigners. If New York is the city that Never sleeps, Boston is a city that Frequently sleeps. Despite Boston's blandness, its diverse yet segregated population, and lack of sizzle, I am grateful for the experience primarily because I wouldn’t have met my Swedish wife as one of those aforementioned friends introduced us! I was treated well and experienced no overt racism in my almost 4 years although I did notice the underlying tension regarding interracial dating. At times, that tension was intense. Being a former Division 1 basketball player, I have always respected Red Auerbach and known about his accomplishments. There is a lack of education regarding Red and the Celtic organization and this sports city suffers for it. Reading the words below (click on link for full story) from Jason Whitlock’s wonderful article should open a few eyes. What gets us through the good times and the bad times are our leaders, the men and women wise enough, bold enough and confident enough to recognize our differences, conceptualize our potential and act without fear of failure. Because of Auerbach, the Celtics are one of America's most racially liberated institutions. Because Auerbach's thinking and approach were so ahead of their time, the Celtics are still to this day completely misunderstood. Some of us still foolishly believe the franchise is anti-black solely because the Larry Bird teams were primarily white during an era when black players dominated the league. The truth is the Bird teams were primarily white because it was the right thing to do at the time. No different than Boston drafting the first African-American player in 1950. No different than the Celtics starting the NBA's first all-black lineup in 1964. No different than Bill Russell being the NBA's first African-American head coach. A free mind is such a beautiful thing. You can say and do things others can't imagine. Long before it was popular, Auerbach supported his once-in-a-lifetime center with a roster that made it easy for Bill Russell to lead and command most of the attention. When Larry Bird came along, Auerbach did the exact same thing, stocking the Boston roster with players who easily fit into an environment Bird enjoyed. I think Larry Bird aggravated souls because he was so good along with being a white man in a predominately black NBA. It was a tough pill for many to swallow so they resorted to petty dislike and jealousy. I have often heard that “Larry Bird is not or was not that good”. White, Black, Red or Purple, Larry Bird was a GREAT player. Anyone who thinks otherwise doesn’t know basketball. He understood the game, had great leadership qualities, won 3 rings and always worked hard. Magic Johnson talked about Bird being the player that he feared the most. That alone should be enough to end any negativity about Bird’s talent. Could I live in Boston again? Probably not but it does have many positives for my family including architectural beauty, Martha’s Vineyard, fantastic sports (Red Sox/Patriots/Celtics – does it get any better?) and a few close friends. 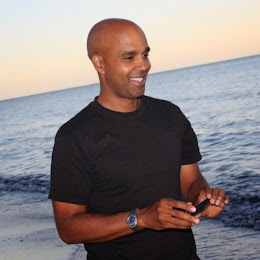 Having been back to Boston often in the last 18 years, the needed "city awakening" was never apparent to me although in 2006 Massachusetts did elect its first black Governor, Deval Patrick; one small step in the right direction. If living in the city of Boston were more like the racially liberated history of the Celtics, it would be one of the most exciting places to live and would sparkle immensely! I hope it gets there one day. I was happy for the Celtics because they won an NBA title in 1 year (with a new roster) which is extremely difficult to do. Red was a big part of title # 17 and a man whose legacy should be understood not misunderstood. 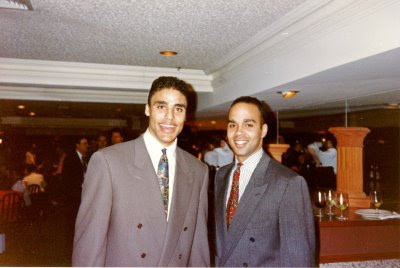 Gswede with a young Rick Fox (left) at a Boston sports event in the early 90's - His best years were spent after his tenure as a Celtic, winning 3 NBA titles with the Los Angelas Lakers. Are you making POWER MOVES?